The Denver Broncos offense needs to change the difficulty level and make the game harder, because the numbers it’s putting up don’t resemble reality. When the Broncos dropped 52 points on the Eagles on Sunday to go 4-0, they pushed their league-leading points tally up to 179, leaving them 52 points ahead of the second-place Bears. The Broncos are now averaging 44.8 points per game, which is more than the Buccaneers or Jaguars have scored all season. With Seattle struggling to pull out a comeback victory against Houston this week, Denver is also the best team in football by acclamation. But where does its offensive start stand relative to league history? Has Denver been the most fearsome point-scoring machine the NFL’s ever seen through four games? And what might teams do to slow it down? First, let’s put the Broncos in context. No other team since the AFL-NFL merger has scored more than 162 points in its first four games,1 leaving Denver’s 179 points as the most any team has put together through the first quarter of a season in modern league history. That’s not proof enough, because scoring levels change from era to era; the average team in 2013 has scored a shade fewer than 90 points through its first four games, while an average team from 1974 produced just fewer than 67 points in its four opening contests. That points-scored figure has to be adjusted for the era in which each team played; our best way to figure out if Denver has the best scoring attack in modern league history is to see if it’s better than the league around it to a greater extent than any other team has been versus its respective brethren. That brings us to z-score (or standard score), the measure that analyzes a figure’s distance from the rest of the data set using the mean and standard deviation from the set.2 By comparing each team’s points scored to the league average (and calculating the standard deviation) for the points scored of each team from that given season, we can get a measure of how much better or worse it was than the average team from that season. Fortuitously, that measure also allows us to compare teams across different years and eras. It’s not perfect, since it can’t account for things like strength of schedule or whether a team let up late in games or not, but it’s a much better measure than raw points scored. As it turns out, even after we make these adjustments, the 2013 Denver Broncos have still scored points at a higher rate through four games than anybody else since the merger.3 The Broncos are scoring points on a per-game basis at a rate of 3.13 standard deviations over the mean, which is unmatched over that 43-year run. No team has ever scored more frequently, relative to its peers, than the Broncos have done relative to the rest of the league in 2013. Wait, the 2005 Giants? Yes. That Giants team scored 136 points through four games in a league in which the average team produced just 79.5 points over its first four tilts. It didn’t hold up, as a team that was averaging 34 points per game fell to fewer than 24 points per game over the final 12 contests, but the Giants did finish 11-5 that year while ending up third in points scored. The other surprise was that the 2010 Patriots finished just ahead of the 2007 undefeated squad, but remember that this was just through the first four games, and those 2007 Patriots “only” averaged 37 points per game during that stretch. It was really over the second quarter of the season that they took off, scoring 183 points across four big wins. That team was 2.3 standard deviations over the mean in its first four games, which falls slightly behind this year’s Broncos team’s first four. So, how have the Broncos gotten here? It’s a combination of things. First, Denver has gotten 18 points from its special teams, with Trindon Holliday returning a kickoff and a punt for scores and Steven Johnson taking a blocked punt to the house on Sunday. That helps. The Broncos also played very close first halves against the Ravens and Giants before blowing them out of the water in the second half, which left scarce time to really justify as “garbage time” minutes in which they might take out Peyton Manning and/or make burning clock the priority. The schedule has been generous, since Oakland’s defense is full of cast-offs and neither the Giants nor Eagles can stop anybody. They’ve also lost five fumbles this year, but haven’t thrown an interception, meaning the Broncos haven’t turned the ball over very frequently. And, of course, there’s the simple majesty of no. 18. What has been really staggering about Manning and his Broncos through four games is just how easy it looks for them. Their drives don’t require big plays or take huge risks, although Denver could probably choose either of those options and succeed if so inclined. They march down the field with the greatest dink-and-dunk you’ll ever see, picking up 10 yards at a time with a mix of screens, option routes, pick plays, and back-shoulder throws. Rarely does Manning need to step up in the pocket and push a 25-yard bullet up the seam to a slot receiver, although those wondering about his arm strength should note that he did overthrow Eric Decker on a would-be long touchdown early against the Eagles. They have a bunch of receivers who create mismatches and a quarterback who does a better job than anybody else in league history of identifying and exploiting mismatches. Hank Stram would be proud of the way the Broncos matriculate the ball down the field. Teams will eventually find ways to slow them down because no offense is perfect, but it’s not going to be easy, since there’s no gimmick involved and no lone receiver to take away. It seemed likely that missing pieces would slow down this Denver team, with Von Miller suspended for the first six games of the season, Champ Bailey yet to play, and Ryan Clady going down with a season-ending injury two weeks ago, but they haven’t yet shown up as a noticeable issue. A team with an elite pass rush will be able to exploit the Clady issue, although I don’t think it will be enough to stop Manning on its own. There are other ways. An ambitious team will try to take away the screens and quick hitches at the line of scrimmage by putting its cornerbacks on the line and bumping Denver’s receivers out of their routes, just as the Patriots did when they famously forced a Bill Polian–inspired rule change in the mid-aughts. That will leave it susceptible to whiffs and bigger plays — and it’s hard to imagine anybody successfully jamming the enormous Demaryius Thomas — but the occasional miscue might be preferable to giving up an easy eight yards on every play. And other teams will just try to force Denver to run, as the Ravens did on many of the third downs in last year’s playoff tilt between these two teams. The loss of Clady would be clearer there, and given how efficient Manning has been, it might be preferable to risk being beaten up in the running game rather than allow quick strikes for touchdowns. I can’t find many teams that would be able to fit that sort of game plan around its personnel without stretching its guys too far. It includes the likes of the Seahawks and the Chiefs, the latter which will compete with the Broncos for the AFC West title.4 Other teams will just have to hope to get very lucky and receive some gifts from Manning, but the league’s leading MVP candidate through four weeks has thrown 16 touchdowns against zero interceptions. If the Broncos keep this up, the discussion will soon be shifting from best quarter-post offense in league history to best opening-month offense in league history, full stop. It’s safe to say that Texans fans are beginning to turn on Matt Schaub. Schaub, whose skill level almost perfectly matches the public perception that the Texans are good enough to make the playoffs and not good enough to do any serious damage once they get there, threw a horrific pick-six on Sunday to open the door for a Seahawks comeback win, which is exactly what ended up occurring in overtime. Houston fans were so angry after the game and Schaub’s third pick-six in three weeks that they went to the parking lot and started burning Schaub’s jersey. That’s the third-most destructive act you can execute as a Houston sports fan after denouncing advanced basketball statistics and attending an Astros game, so these are pretty brutal times. Allow me to play both sides here. Schaub’s interception was grotesque and impossibly ill-advised, and it’s been a distressing stretch of pick-sixes from him, but this bad run comes with some excuses and there’s no reason to think that Houston absolutely needs to upgrade from Schaub to have a quarterback “good enough” to win the Super Bowl. Start with that throw, which was more shocking and virulent than anything else on television Sunday night. The throw itself is ugly on aesthetics alone; Schaub rolls out right off play-action and, with a man in his face, decides to lob up a pass to a receiver he must have thought was wide open. Somehow, he fails to see the best cornerback in the league lurking behind that tight end, and Richard Sherman is all too happy to undercut the throw as it hangs in space for all eternity. It’s a pass we would all have made fun of for weeks had it been thrown by Mark Sanchez or Blaine Gabbert. What’s worse is that it came in a situation when Schaub needed to err on the side of protecting the football. Houston was facing a third-and-4 with 2:51 left in a game where it was up 20-13; even if the Texans didn’t convert on third down and punted, Seattle was going to have to drive the length of the field and score a touchdown to tie the game. I’m all for being aggressive and trying to win games, and I actually like Gary Kubiak’s decision to try to throw the ball with a safe pass underneath on third down, but Schaub should never have even considered forcing a throw. He should have been happy to take a sack and either run clock or force Seattle to take a timeout. He needs to know that, and you can imagine how hard it will be for Kubiak to trust him in the same situation next time, even though a throw might be the best call in that game down the line. In all, ESPN Stats & Information calculated Schaub’s interception to be the most meaningful play of the week in terms of win expectancy, as the Texans had a 95.1 percent chance of winning the game before the play and merely a 56.3 percent chance of winning afterward. The game wasn’t over, since Houston still had a two-minute drill and two drives in overtime to try to win the game, but it failed to score on any of those possessions and lost a heartbreaker when the Seahawks kicked a field goal to win it late in overtime. Terrible throw. Now, again, let’s put it in context. It was Schaub’s third pick-six in three weeks, but it’s not like Schaub has some disease where he throws awful pick-sixes; according to Pro-Football-Reference.com, Schaub didn’t throw a single pick-six in either the 2011 or 2012 seasons. He has 10 across seven seasons as the Houston starter, which isn’t an egregious average. Fans wouldn’t think too hard about a quarterback throwing an interception per week over a three-week stretch, but because they’ve resulted in instant touchdowns, fans are naturally more upset about the results of those interceptions. That’s part of being a fan, but it doesn’t mean Schaub is somehow doomed to be a guy who gives up too many dangerous throws for pick-sixes. Plenty of famous quarterbacks have thrown three pick-sixes (or more!) in a three-week stretch before or during successful careers that included Super Bowl–winning seasons. Ben Roethlisberger and Drew Brees each had three-game stretches with three or more pick-sixes and then didn’t throw another one for a year each. Peyton Manning had such a stretch in 2001, threw one pick-six between 2002 and 2006, did the same thing again in 2008, didn’t throw a pick-six in 2009, then threw four of them in two weeks in 2010. He’s still doing OK. In fact, Eli Manning threw three pick-sixes in one game against the Vikings in November 2007 and didn’t throw another pick-six until the following campaign. That ugly game also started a dismal run for Eli, one which suggested he might not be ready to play at the high level the Giants envisioned after taking him first overall. Sure enough, Manning was dragged to the playoffs by his team at the end of the season and put together an incredible run there, producing an unlikely Super Bowl win just two and a half months after his three-pick-six day. That Eli could play so poorly and still get a ring speaks volumes to how useless the “good enough to win the Super Bowl” signifier is. We5 treat it at times as if it’s some kind of clear line of demarcation — like you need to be this tall to ride the roller coaster and this good to win the Super Bowl. Recent history should tell us that there’s no such clear line. Pretend, for a moment, that Eli Manning and Joe Flacco had produced the same Week 4 performances this week without any notable run in the playoffs to their name. Would anybody in their right mind look at their days (or 2013 seasons, for that matter) and suggest they were good enough to win the Super Bowl? Of course not! In fact, Giants and Ravens fans would be sitting in the same parking lots saying the same things about how they needed to upgrade at quarterback to have any hope of winning a Super Bowl. Because Manning and Flacco each already won a Lombardi Trophy, we don’t think about them in the “not good enough to win a Super Bowl” way, despite what their poor performance would otherwise suggest. Just as they were capable of winning a Super Bowl and are still capable of having bad games, Schaub can have a bad game (or string of games) and still be capable of winning the Super Bowl. And like any quarterback, he’s going to need help from his team, which hasn’t offered much: Arian Foster’s per-carry numbers are down, as he’s averaging 3.8. 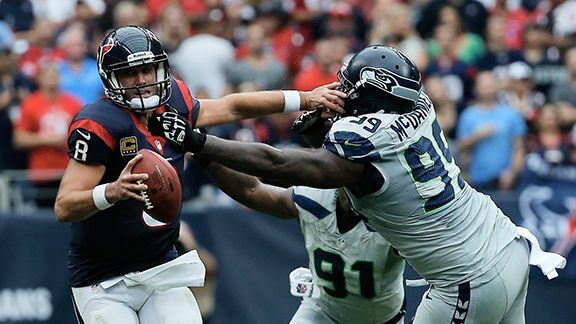 Andre Johnson got hurt and has missed time over the past few weeks. The team has already been without elite left tackle Duane Brown for the past two games, and star inside linebacker Brian Cushing missed the fourth quarter (when Seattle came back from 20-6 down to tie it up) with a concussion. Remember that Flacco struggled a year ago once his team started losing talented veterans left and right and only really righted the ship once they started making it back onto the field in January. I feel comfortable saying Schaub is good enough to win a Super Bowl, because I’ve seen quarterbacks who were worse than him during their season at the helm get hot during the playoffs and win the big trophy. As critical as you are of his throw (and you should be, since it was terrible), there’s nothing about it that proves he can’t win when it really counts in the longer term. Let T.J. Yates sit on the bench. Schaub should be the guy in Houston. At the very least, when you’ve got nothing to wear six weeks from now, you’re gonna really wish you didn’t burn your jersey in the parking lot. As the East Coast reeled in the aftermath of Breaking Bad‘s finale, the Patriots and Falcons played out one of the more entertaining games of the year on Sunday Night Football, eventually won 30-23 by the Patriots after no small amount of uncertainty. 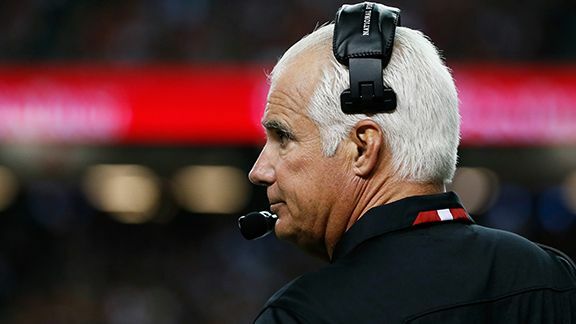 That game involved a number of key coaching decisions from Atlanta coach Mike Smith, a regular in the Thank You for Not Coaching section over the past couple of years for late-game decisions both good and bad. While I’ll get to most of Smith’s work in the full-length TYFNC on Tuesday, I want to talk today about the decisions he made on that penultimate drive, with the Falcons down 10 and with the ball deep in New England territory. He got it wrong in a way that I think many other coaches would have in the same scenario by kicking a field goal too early. To set the stage, that play came on fourth-and-1 with three minutes left in the game and the ball on the New England 7-yard line. Smith’s Falcons trailed by 10 points, so while the team would obviously prefer a touchdown, a field goal would also help matters by making it a one-score game and extending Atlanta’s chances of competing. As most coaches would in the same situation, Smith chose to kick the chip shot field goal, bringing the Falcons within those seven points. The Falcons failed on the ensuing onside kick but then held the Patriots on downs when Tom Brady fumbled the snap on a fourth-and-1 sneak attempt. Atlanta quickly drove the ball downfield, only to fail on a fourth-and-7 from the 10-yard line with 41 seconds left. As this game turned out, I think it’s pretty clear Smith made the wrong call, since the fourth-and-1 he passed on was much easier to convert than the fourth-and-7 he was stuck trying later. That’s just one outcome, but I think it’s a clear case before the Falcons even knew that they would have to convert a fourth down to score a touchdown on the second drive. • They lose if the Patriots score on their next drive. If the Falcons try an onside kick and fail to recover, as they did, the Patriots can try to run the clock out. If they get stuffed in field goal range, the Patriots can kick a field goal to go up 10 again and end the game. If the Falcons score a touchdown first, a Patriots field goal would put Atlanta down only six, giving it another opportunity to win the game with a touchdown drive. • They have to regain the yardage needed for a touchdown on the subsequent drive that they’ve already produced on this one. If the Falcons score a touchdown on this drive and need only a field goal to tie on the subsequent drive, they don’t need to drive the full length of the field to score. Instead, they only need to drive the ball to about the 25-yard line for a comfortable field goal try. Since the ball is already on the New England 7-yard line, that’s a minimum of 19 extra yards the Falcons will need to pick up on the subsequent drive to score a touchdown (since they’ll need those six final yards on both drives), yards that take precious time off the clock. • The Falcons need to go for it on one of the two drives anyway, and a failure will be demoralizing regardless of when it comes. One of the common arguments against going for it early is that you end the game prematurely, which demoralizes your team by virtue of not extending the game for as long as possible and giving it a chance to win. It doesn’t fit here. The Falcons can’t tie this game by kicking field goals; their only hope is to score a touchdown on one drive and a minimum of a field goal on the other drive, which means they’re going to need to score a touchdown at some point. Going for it on fourth-and-1 early, if anything, shows faith in your team. Had the Falcons gone for it then and failed, they would have been demoralized, of course. But do you think there was a single person in that home locker room after the game who wasn’t demoralized? Was there anybody in that room who said, “Well, at least we kicked that field goal early, because it gave us a chance to tie the game up at the end?” Of course not. • The only way to win the game in regulation is by going for it on the first drive of the two. The 10-point play — scoring a touchdown and kicking a field goal — only creates a tie game.7 Even if the Falcons successfully pulled off the play, they still have to go to overtime and have no more than, oh, a 55 percent chance of winning. If the Falcons go for it on the first drive and score a touchdown, that opens up the possibilities dramatically. Now, their second drive can actually win them the game. The Patriots have to stay in a very conservative defensive shell to try to prevent a game-winning touchdown from getting past them, creating space underneath for intermediate throws and catch-and-run opportunities, where the Falcons excel. This would, coincidentally, make it easier for the Falcons to get in field goal range. If the Falcons score a touchdown on the second drive, they’re up four points with a few seconds left, pushing their win expectancy to 99 percent. If they can’t knock the ball in, they can still kick a field goal and go to overtime, just as they would have by kicking on fourth-and-1, maintaining the same 55 percent win expectancy. Think about it for a second. How can you be willing to trade all those advantages for the sureness of kicking a chip shot field goal and merely not losing for another couple of minutes? You’re putting off the inevitable — you’ll need to score a touchdown on one of these two drives — and leaving it for what will, the vast majority of the time, be a much more difficult situation, while preventing yourself from having any hope of winning the game in regulation. I don’t fault Smith personally, since I think 90 percent of coaches would have made the same move, but it’s a hyper-conservative call that speaks to the level of ingrained risk aversion there is around the NFL. Ironically, a much less celebrated coach correctly handled this very situation earlier in the day but came up short. Dennis Allen’s Raiders were down 10 points to the Redskins with 3:38 left and faced a fourth-and-1 on the Washington 17-yard line. They rightly went for it, but Matt Flynn lost the ball on a quarterback sneak and was stopped, ending Oakland’s chances of winning. I’m sure they were unhappy with the final outcome, too, but they picked up the same “L” that the Falcons did. The only differences are that Allen lost by three more points and went down giving his team its best chance of winning in the process. 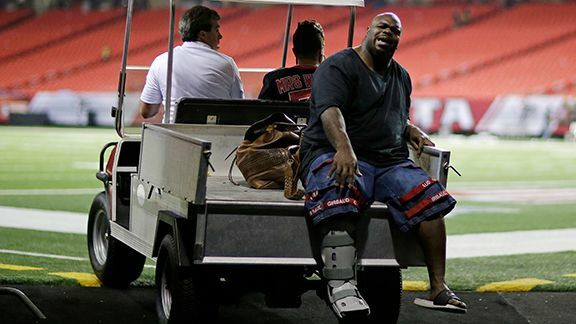 News broke early Monday morning after the game that Patriots defensive tackle Vince Wilfork, who was carted off the field in the first quarter with his cleat and sock removed, suffered a torn Achilles tendon, an injury that will end his 2013 season. The news is a crushing blow to the Patriots, who have relied on Wilfork as the base of their defense for several years. Wilfork had been the crux of the unit as Bill Belichick rebuilt that side of the football, often serving as one of the few standouts on a below-average Patriots D. In the lead-up to Super Bowl XLVI, our Chris Brown wrote a fantastic piece on how the Patriots used Wilfork as the fulcrum of their defense, allowing defenders to play a one-gap 4-3 principle on one side of him with other Patriots lining up in a 3-4 two-gap system on the other side. Wilfork’s versatility and effectiveness in either role allowed Belichick to apply his vaunted defensive mind toward getting the most out of the limited players around the former University of Miami star. New England could not have been prepared for a Wilfork injury if it tried, but it was particularly vulnerable to such an injury this season. The Patriots have lined up in a 4-3 a fair amount, with Wilfork playing alongside veteran Tommy Kelly. The backups there are undrafted free agent Joe Vellano and journeyman Chris Jones. That’s not going to do up front. As a result, it wouldn’t be a surprise to see Belichick shift back toward more traditional 3-4 fronts, which would create more snaps for second-round pick Jamie Collins and a possible promotion for Marcus Forston from the practice squad. He’ll also likely look to bring in at least one veteran free agent; former Patriots starter Kyle Love, cut by the team after being diagnosed with diabetes last May, could be an option, along with the likes of Ron Brace and Forston. In any case, regardless of what the Patriots decide to do, they’ll be at a huge disadvantage without Wilfork for the remainder of the season. Finally, a quick request. When Wilfork went down with his injury in the first quarter, Falcons fans — you know, the same ones who left the stadium half-empty as Ryan was leading that Atlanta comeback in the fourth quarter — booed under the impression that he was faking an injury. That needs to stop. It’s a trend that’s gone around the league for the past few weeks because it happened a bunch in that Eagles-Redskins game in Week 1. It’s not cool. It’s one thing when fans wrongly boo a player who is genuinely injured because they think he’s faking it. That’s stupid and embarrassing enough. It’s another when fans boo players in a situation when it wouldn’t even make sense for a player to fake an injury. Like Wilfork last night, because the Patriots are definitely not going to fake an injury by taking their best defensive player out for a snap. Or, since Patriots fans are no better, in the Jets-Patriots Thursday Night Football game a couple of weeks back, when Muhammad Wilkerson went down late in the fourth quarter of a game when the Patriots were just running clock and a defensive injury wouldn’t have stopped it. This just seems like a basic human decency thing. If a backup defensive back goes down with cramps for the third time in six snaps late in a key game, I can understand a few boos. But if a player goes down in a situation when you can’t actually understand why the injury might have happened beyond just “DERP YOU MUST BE FAKING,” maybe just chill with the booing. You’re never going to look back and say “Man, I wish I had booed that injury I thought was real, that really would have helped the team!” Yell whatever you want, but let the guy suffering a career-shortening injury have a tiny bit of applause when he gets up. It makes your city look good. The 1966 Cowboys scored 183 points across their first four games. If this sounds familiar, it’s a concept I’ve pulled out for golf. Also, you probably learned it in eighth grade. Because only 28 of the 32 teams in the league have made it through four games (with two teams on byes and two playing on Monday Night Football), I’ve compared the Broncos to the other 27 teams who are through four games for these figures. I also ran a second set of calculations working under the assumption that the four teams who haven’t yet started their fourth game would score points at the same rate with which they scored points during the first three games of the year, and that didn’t notably affect the results (i.e., the Broncos were still slightly more than three standard deviations over the mean). It does not include the Jaguars, whom the Broncos will host in two weeks’ time. The expected opening line for that game is around minus-28, which would be the largest in NFL history. That includes me at times, if I’m being honest. I’ll leave the possibility of a successful onside kick out for now, even though the Falcons picked up the previous one, because it’s so unlikely — it’s at about 10 percent historically. I suppose the Falcons could go for two on their touchdown to try to win it there, but if you’re going for two, there’s no reason to pass up a fourth-and-1.